Not wasting time, this home town gets destroyed before the game starts. No! My beloved peasant village! : The hero's home town, city, slum, or planet will usually be annihilated in a spectacular fashion before the end of the game, and often before the end of the opening scene. The town the hero first appears in is often his hometown. There is a very high chance said town will be demolished by evil forces, prompting him to quest, although sometimes the town is inaccessible for other reasons (banishment, for example). This is not strictly limited to hometowns. It's almost guaranteed that wherever the hero starts out—be it town, planet or even universe, depending on the scope of the story—is likely to be rudely destroyed by forces of fate as soon as his back is turned. Frequently paired with Refusal of the Call, since The Call Knows Where You Live, and often the reason You Can't Go Home Again after Easing Into the Adventure. Often results in the hero watching the town burn, emotionally overcome at having their source of joy destroyed. Freiza does precisely this to the Sayain's home world in Dragonball Z, although it actually takes place before the series proper starts, and is shown in flashbacks. The Bardock special also recounts the events leading up to this Class X Apocalypse How. In UFO Robo Grendizer -one of the Mazinger Z sequels-, Duke Fleed's planet gets destroyed two years before the beginning of the series, forcing him to flee to Earth. Sara from Soukou no Strain has a Doomed Space Academy that is attacked by her brother; she is the only survivor. In Mahou Sensei Negima, the hometown of Negi and Anya is attacked by demons that turn nearly all the townspeople to stone. Negi is saved by his father who gives Negi his staff before leaving. We've now learned who was responsible - the Megalomesembrian Senate - and that the entire attack may have been an assassination attempt on Negi's life. This is subverted in Fullmetal Alchemist where Ed and Alphonse Elric set fire to their own house so they can't turn back. Their attempts to redeem themselves from this "original sin" drive the plot. They do, however, make relatively frequent visits to their home town to call on childhood friends. Various points (at least in the manga) indicate that while it hardly seems devastated, it would have been more of a bustling city had the Ishvalan civil war not happened. Other points in the manga suggest it was simply attacked and damaged slightly rather than completely destroyed. As Ed is the only character we hear referring to it being destroyed this can probably be chalked up to him exaggerating things. In the manga, Hohenheim has an alternate interpretation of Ed and Al's motives, saying that they did it to forget trying to transmute their mother. Once upon a time, there was a space colony called Side 7. The Magical Girl Lyrical Nanoha franchise has Amia, a mining town found in the 3rd Administrated World - Vaizen. It was destroyed in year 74 of the new Mid-Childa calendar, seven years before the events of Force. Official records state that it was an accident involving earthquakes and poisonous fumes. Tohma, the main character of Force and the only survivor of that event, believe otherwise and has made it his life's goal to find the true culprit behind the disaster. Naruto - Konoha village is almost destroyed by the Nine-Tailed Demon, and then gets leveled by Pain post Time Skip. In One Piece, eventual-protagonist Nico Robin is the product of this, given that she is hunted by the World Government precisely because she is the sole survivor of the Marines' otherwise utter annihilation of her hometown. Kazuma's hometown was destroyed before the beginning of Kagerou Nostalgia; the village he's defending in the opening doesn't last long either (although in his defense, it would have been gone even quicker without him). "I'm the last Czarnian. I fragged the rest of the planet for my high school science project. Gave myself an A." Elf Quest. Humans burn down our heroes' forest holt, forcing them to go on... well, the entire rest of the story, basically, rather than just staying home. Also, Leia's home planet gets exploded. In Conan the Barbarian, the main villain Thulsa Doom destroys young Conan's village and mercilessly slays his mother before his eyes, leading him to be sold into slavery where he is hardened by forced labor and trained as a champion gladiator. When he eventually wins his freedom, embarks on a career as a warrior, and seeks out Thulsa Doom to take his revenge, the villain calmly points out to Conan that everything he became is because of Doom himself and Conan actually owes him. (He even fits in a bit of the But for Me It Was Tuesday, too.) Of course Conan is anything but grateful, but still the point stands. In the book, Rico is from the Philippines. His mother (not his father) died in the destruction of Buenos Aires (by a nuclear bomb, not a guided asteroid) just because she happened to be there visiting relatives. M. Bison: For you, the day Bison graced your village was the most important day of your life. But for me... it was Tuesday. Titan A.E. , anyone? The main character's home planet is destroyed. Robin Hood: My dog, Pogo? The rebooted Star Trek movie involved as a key plot point the destruction of Vulcan by a Romulan lunatic from the future, and its effect on Spock. Lemur Island from Dinosaur, since it was unfotunately located very close to the meteorite's blast radius. Also, the region where Kron, Bruton, Neera, Eema, Baylene, Url, and the rest of the Herd came from. Subverted, however according to Dinosaur: The Essential Guide, which confirms that the Nesting Grounds is actually indeed their original home. The reason why they all do not stay there all the time is because in the winter, the Nesting Grounds actually becomes too cold for the dinosaurs to lay their eggs. Barbossa and his men attack Port Royal in Pirates of the Caribbean. In another DreamWorks film, Megamind, both Megamind's and Metro Man's planets (and to a much lesser extent, possibly their home solar system) are sucked in by a black hole. 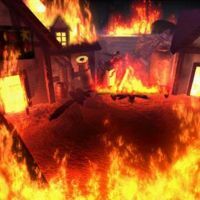 In yet another DreamWorks film, Kung Fu Panda 2, Panda Village, the birthplace of Po the panda, is burned to the ground by Shen's wolves and cannons. On the book of Genesis (2:4 - 3:24), Adam and Eve (plus all of their progeny) are banished from the Garden of Eden after eating from the Fruit of Knowledge. In The Infernal City, Annaïg's and Mere-Glim's hometown of Lilmoth undergoes a miniturized Zombie Apocalypse. The Hitchhiker's Guide to the Galaxy opens on a Thursday morning as Arthur Dent looks outside his house at a bulldozer poised to demolish it to make way for a bypass. Coincidentally, the Vogon Constructor Fleet demolishes Earth later that day in order to build a hyperspace bypass. Before blowing up this Insignificant Little Blue Planet, the Vogons tell its inhabitants that they should have seen it coming: as with Arthur's house, the plans for the bypass were on file, even if some Obstructive Bureaucrat did store them in a slightly out-of-the-way location ("What do you mean, you've never been to Alpha Centauri?") "I could never get the hang of Thursdays." Arthur remarks as all this happens. In The Pilgrims Progress the City of Destruction (the main character's hometown) will be destroyed in the end of days by fire and brimstone, prompting him to escape to Celestial City (heaven). In Blish's Okie series, the flying cities are forced off Earth by the disaster of world conquest by a totalitarian state. So each of them is a town with a Doomed Hometown. Subverted in the second book of The Sovereign Stone Trilogy. The Evil Overlord sends his henchman to the home village of one of the protagonists with orders to burn the village, massacre the inhabitants and torture the survivors to death for information. The villages however are part of a tribal culture whose main exports are fearless barbarian mercenary's, they massacre the henchman, torture the boss henchman to death and stake out his body as an example to those who will follow, before burning their OWN village to the ground so the enemy (who knows where they live) will get no use from it then go off to found a new village elsewhere. The Beastmaster. When Evil Rip Torn attacks Dar's villiage and kills his dog, Dar dresses in leather, burns the bodies and goes on a grand quest. Averted hard as of the most recent book: far from being demolished, the Two Rivers is thriving, having emerged from its sleepy isolationism, discovered the military application of being the home of some of the world's best archers, produced some of the most powerful young magic-users (both male and female) in the world, peacefully absorbed one nearby nation-state and built strong ties to two others, and gone from being a forgotten backwater of the queendom of which it was only nominally a part to being officially recognized and elevated above all other member states in what is quickly becoming one of the largest and most powerful empires on the continent. Inverted, to an extent, in The Lord of the Rings. You Can Go Home Again, but home is not the same: the Big Bad is defeated, but the homeland they set out to protect has become a Dystopia. There aren't even any hints of this until the main plot of the book is over. It's compelling enough to avert the Ending Fatigue you'd expect when the climax is in Chapter Three of the last book, and its omission is one reason that Ending Fatigue exists in the movie, as it's a new source of tension in the scouring of the Shire, which has to be resolved before the final ending of Frodo's and Bilbo's trip into the west and Sam's epilogue. With the scouring removed in the film so is the tension, but the rest remains the same so the plot spends its last hour just coasting downhill. In Suzzanne Collins' The Hunger Games series, Katniss Everdeen's hometown District 12 is bombed into oblivion under the orders of President Snow as retaliation for the occurences of book two, Catching Fire. The book ends with some one telling her it's gone, so you know it's important. Later on, Katniss visits the District 12 ruins and is noticably guilty over the fact that it's gone, and the bombing of 12 is brought up multiple times throughout the last book. In The History of the Galaxy series, the Norls are a race of Heavyworlder humanoids, whose homeworld is rendered near-uninhabitable by a supernova. Unfortunately, their new home is about to suffer the same fate (apparently, even with FTL outrunning a supernova is difficult). Fortunately, the humans find out about this just in time and manage to shield the new planet from the destructive wave using powerful gravity generators. In Jack Campbell's The Lost Fleet Captain Tulev's Backstory was the destruction of his home system. He offers to draw up the list of highly critical systems because he's unbiased. Star Trek: The Next Generation's Ridiculously Human Robot Data was created in a Colony on the planet of Omnicron Theta on which all life was mysteriously and utterly annihilated (right down to the level of soil bacteria) by a space entity that resembles a giant snowflake. After the disaster, Data was found by the crew of the USS Tripoli when they came to investigate. He was deactivated during the attack so the creature didn't count him as alive, and is effectively the sole survivor of the entire colony. Several later episodes see them either dealing with the return of this creature, or tracking it down. Not only that. The humans original homeworld Kobol was also devestated by war. The 12 colonies were founded after the devastation of Kobol. The 13th tribe comprised of the Kobol equivalent of humanoid cylons left Kobol 2000 years prior to the other 12 tribes and landed on the first Earth. After the 13th colony created their own version of robot cylons the same cycle happened again and that Earth was destroyed saved for the final five. The final five being the ones who later help the 12 colonies robot cylons create the humanoid cylons which end up destroying the 12 colonies. The Chicago that Buck Rogers knew was destroyed (along with most of the rest of Earth) in a nuclear war some 500 years before the series proper takes place. A new, if somewhat more sterile city has been built close to the blackened, mutant-infested ruins. In the T.V series Lost one of the antagonists, "the man in black" has his village burned down. In the game book series Lone Wolf, the eponymous character's journey begins with the Darklords' destruction of his monastery, leaving him Last of His Kind. In the Dungeon magazine adventure path The Age of Worms the party returns to their hometown (or at least their town of residence at the start of the campaign) after finishing a piece of plot elsewhere only to find it in ruins. This is about the level when overland flight comes online, so they may even get a bird's eye view of the destruction. Rydia's hometown, the village of Mist, is burned to the ground early in Final Fantasy IV; this is a noticeable subversion in that the destruction was performed by the hero. (To be fair, he was tricked into it...depending on the translation, anyway.) Also, most of the inhabitants survived (though the rest of the summoners were wiped out). Further subverted in that the hero's hometown actually ends up becoming the bad guy's home base for a while, and when you return, it's a literal case of Storming the Castle. Even then, it never gets destroyed. Final Fantasy VI contains an interesting aversion. Early in the game, Kefka starts to burn down Figaro Castle as a punishment to Edgar for refusing to give Terra up to him. For a moment, it seems like Edgar may lose his kingdom. But instead, he gets away and then the entire castle sinks Beneath the Earth. While not immediately accessible right after this event, Figaro remains available for the player's use all the way through the game, ever after The End of the World as We Know It. Though Kefka does bring an end to Cyan's kingdom. Killing everyone in the Kingdom by poisoned well. Vector, the Empire's capital, by the end of the game, is trashed by espers, abondoned, and then crushed underneath Kefka's tower. Cloud from Final Fantasy VII is originally from Nibelheim, which was razed by Sephiroth. (It later got rebuilt and repopulated in an attempt to conceal that it ever was destroyed, which briefly confused the heroes). Later (chronologically speaking), he and the party are forced to leave Midgar to avoid the authorities. This shortly after Shinra destroys the Sector 7 slums, where AVALANCHE is based. And then the entire city is mostly destroyed later on! Or that pre-game hero Zack's hometown of Gongaga is destroyed by Going Critical. What's worse is that Crisis Core reveals that however the reactor exploded, it occurred during the four years he was a test subject. When he arrives, the whole fact that the town is mostly a crater and there's gravestones all around the huts of whoever survived doesn't seem to really faze him. From the Grand List of Console RPG Cliches. Rule 48: "Zidane's Curse (or, Dirty Pair Rule)"; An unlucky condition in which every major city in the game will coincidentally wind up being destroyed just after the hero arrives. In Final Fantasy II, Fynn is taken over by the empire, and all of the protagonists' parents are killed, prompting them to want to join the rebellion, in addition to wanting to find Maria's brother Leon. The rebellion eventually retakes Fynn, though. Sadly, every town except Fynn is smashed into dust by the Empire. The Land of Departure in Birth By Sleep eventually becomes Castle Oblivion, to prevent it from being destroyed by darkness. In the ending, the village is rebuilt after freeing the survivors from the enclave, and the Chosen One leads the village. At the end of the first chapter of Jade Empire, the little town of Two Rivers is destroyed, and almost all of its populace wiped out by Imperial forces. Similarly, in DQIV, the main character (who you only get to play after all the other characters have their chapters) has his/her humble hamlet simply because they are The Chosen One and the Big Bad's minions found out. Also in DQIV, the second chapter ends with the heroes returning triumphantly to the castle where they started the chapter... only to find the place utterly deserted and eerily quiet. Returning in a later chapter, the heroes find that the castle is now inhabited by monsters. Santa Rosa/Whealbrook in Dragon Quest V may not be where The Hero is borned, but it's the place he lives since he can remember, and it gets destroyed between the Time Skip as a bad natured queen from Reinhart/Coburg blames The Hero's father for kidnapping a prince. In Xenogears, the main character, Fei, unintentionally destroys his hometown, Lahan. Fei's attempt to pilot a giant, top secret, crash landed, military robot ("gear") in the middle of a firefight leads to the town's destruction. Also a prime example of devastating Lost Technology. And speaking of all things Xeno, at the beginning of Xenosaga Ep. 1, the Woglinde (the starting area of the game, though certainly not Shion's home, which has already been destroyed) is blown up. Miltia, Shion's home planet, gets devastated some time before the beginning of the game in what is referred to as the "Miltian Conflict". On top of that, it gets disconnected from the UMN network, making it inaccessible by FTL means. For all intents and purposes, most consider it destroyed. The game actually plays with this in a rather interesting way, as this damnation of the hometown had apparently been planned by one of the villains in order to get the hero going. The Xeno series just loves this trope: Not only is Lahan toasted right off the bat in Xenogears but later Fei-as-Id destroys the capital of Solaris, a.k.a. Elly's and Citan's homeland, a.k.a., the homeland of his lover and his mentor respectively. In Xenosaga Episode III we learn that Kevin's homeworld was also destroyed before the start of the 'gameline,' while Earth itself has been lost for centuries already, if not more. Oh, and the Kukai Foundation, a giant floating city-state and home to Jr. and his peripherals, is also attacked and partially evacuated during the game. It would actually be easier to list Xeno hometowns that aren't doomed. And of course, Xenoblade keeps the tradition with Colony 9. Although this one gets better right away. Not that the main cast cares that much about it since they believe Fiora died in the mekon attack that destroyed it. In Homeworld, the planet and most of its fleet are decimated by an invasion force moments after the first interstellar excursion is made, leaving only a rag-tag fleet of survivors led by you (a la Battlestar Galactica) to fend for themselves. Somewhat ironically, the titular homeworld is in fact not the planet destroyed at the beginning. After a fashion, this happens twice in Star Wars: Knights of the Old Republic. The very first section of the game takes place on a spaceship which gets shot down, and the next section takes place on a planet which gets bombarded to oblivion just as the protagonists are leaving. It actually happens three times as the Jedi Academy on Dantooine (the planet visited after the aforementioned "planet bombarded to oblivion") is attacked and destroyed by Darth Malak after a certain number of Plot Coupons has been collected. You meet some survivors though. Star Ocean the Second Story has a version of this where the planet your character starts on is destroyed after they leave it. And also the destruction of Future Dude Claude's starship, late in the game, for no other reason than to allow the bad guys to show off their uber-powerful weapons. Jerks. Star Ocean: Till the End of Time has the resort planet of Hyda IV, which is attacked when the main character is chillin' out on it. Earth (along with most of the galaxy) gets destroyed midway through the game. In Neverwinter Nights 2, the (playable) prologue is a fair in the protagonist's home village, West Harbor, which is invaded and burned in the beginning of the main game. There is a subversion, however, as West Harbor is not quite destroyed and can actually be visited later at almost any point in the game, although the player can't do much there ? and a double subversion as it is much later invaded again and destroyed during the player's absence. An is rebuilt in the add on pack Storm of Zehir. Where it can be destroyed again. Similarly, in Fable I, the main character's hometown of Oakvale is ransacked by bandits, and he's the only survivor. Later in the game, however, he gets to return to the rebuilt and repopulated town. The Evil Empire invades Keldy's hometown in Dawn of Mana, as it's sitting on top of both the Sealed Evil in a Can and the Sealed Good in a Can. Downright inverted in Tales of the Abyss—it happened to the villain during the backstory and is his main motivation for his Well-Intentioned Extremist ways. Occurs repeatedly in Summoner: First, you accidentally destroy your beloved peasant village of Ciran in an attempt to defend it with your fledgeling powers, killing your friends and family; after disowning your powers, you settle down in Masad, which years later gets burned to the ground by the Big Bad's invading army in their search for you; you then resolve to confront your past and defend the nation of Medeva, which you accidentally end up destroying as well after a suitable Big No. This occurs in Legend of Dragoon to the main character Dart's hometown in an almost stereotypical fashion. Not only is his adopted hometown destroyed in the intro, we later find out that his actual birthplace was also desolated years before the game. The real question is how the hell did they even find the village in the intro? It's not like there's all that many people in it, there's like 10 people tops. I'd say this is a somewhat averted variation on The Call Knows Where You Live given the unliklihood of the Serdian army stumbling across the village or even knowing of it's existence. In SaGa Frontier, Riki's entire quest focuses on saving his doomed hometown that turns out to be a Xanatos Gambit on the part of the Big Bad. Deus Ex Invisible War begins with Chicago being destroyed by a nanological terrorist attack. Vela somewhat subverts this though, as under the Earthling's surrender agreement the Ur-Quan were within their rights to simply destroy the colony rather than slave shield it. It is in a sense a twisted act of mercy. Done from the outside in The Elder Scrolls IV: Oblivion. One of the Hero's first quests is to rescue the Emperor's last surviving heir from the burning remains of his hometown. The tutorial area of Guild Wars begins in the player character's Doomed Home Kingdom, before switching to a ruined version (in the main game world) once the tutorial finishes. The Homestar Runner graphical text-based adventure Peasant's Quest starts with Rather Dashing's thatched-roof cottage being burninated by TROGDOOOOOOOOOOOOOOOOOOOOOOOOOOOR! Resident Evil series, especially Resident Evil the Umbrella Chronicles which shows from start Jill Valentine's city (where she works as part of SWAT-like police outfit STARS) being infected with a virus made by an Evil Corporation (turning everyone into zombies and worse) before being obliterated with a tactical nuclear strike by the US government as a safety measure for the rest of the country and her fighting the corporation from then on (going to an Antarctic base among other things). This trope started the Halo wars as human planets were "glassed" by genocidal aliens. And of course, the doomed planet of Reach was the "hometown" of the Master Chief. His actual homeworld of Eridanus II was also "glassed". Interestingly, the San 'Shyuum (AKA the Prophets) homeworld is also likely destroyed... by the Prophets themselves, after they think it's a good idea to blast off from the planet in a Forerunner dreadnought while taking a good chunk of it with them. Then their new homeworld, the High Charity is overrun by the Flood and crashed into the Ark. In Baldur's Gate you are forced to leave your hometown, and cannot get back until much later in the game. As it's a fortified monastery defended by a startling number of priests, mages, and soldiers considering its size, it's perfectly fine. Later in the game however, just about everyone you know there is killed and replaced with evil doppelgangers. Geneforge does this with the Wizarding School you start out in—swarms of monsters slaughter all but six of the people there while a creepy glowing woman rants about "fires of justice." You, a mere untrained apprentice, are the only one available to inform the nearby fort about the attack. If you pick the colonist background in Mass Effect, Shepard's homeworld was Mindoir, a tiny farming colony that is located in the Attican Traverse where the batarians fought against the humans for territory rights. Ironically when Shepard was 16, the batarians razed the planet, killed almost everyone in the colony except a couple of leftovers who are being dragged in chains for slavery while Shepard was lucky enough to escape from their clutches. An Alliance patrol found him/her but all of Shepard's relatives and friends died from the raid. As the result of that, it motivated Shepard to join the military two years later. Shirou from Fate/stay night had to live through a large portion of his hometown burning down around him at the age of eight—he was one of only a few people who survived the inferno, and the trauma of having lived through it while everyone else he saw died is one of the base pillars of his current mindset. Hayabusa Village in Ninja Gaiden. In the first Dawn of War game, Captain Gabriel Angelos begins the game recently having returned from a campaign where he had to request an exterminatus on his own home planet. It'd probably be best to not mention it around him. Later, Ner,Zhul, the orc largely responsible for this turn of events, destroyed Draenor further by opening so many portals to other places, it wrecked havoc on the stability of the planet. This happens in the expansion for the second Warcraft game. Stormwind later gets rebuilt. But it gets (partially) destroyed, again, in the latest World of Warcraft expansion, Cataclysm. The Kaldorei, or Night Elves, draw the attention of The Burning Legion(demons) due to the use of powerful magics by the Highborne(nobility). Under demonic influence, the highborne facilitate an invasion by the Burning Legion. This lead to a war so big, it destroys much of the Kaldorei kingdom and those of smaller races before the end. The resistance manages to to stop the invasion, but the recoil from the portal used in the invasion is so powerful it splits the continent into two! As a result, the surviving Kaldorei turn from arcane magics and focus more on the druidic arts. The Scourge, an army of undead, sweep through the northern human kingdoms, destroying all of Lordaeron. They then head north and destroy the majority of the High Elven kingdom. The source of high elven power, the Sunwell is also destroyed. These events led the majority of those survivors to rename themselves the Sin'dorei, or Blood Elves. Warcraft 3. Averted for most of the backgrounds in Dragon Age: Origins. The Alienage suffers riots and a vicious reprisal but remains standing, the great bulk of Orzammar is much as you left it for Dwarves, the Dalish tribe doesn't even have a home, and the decision to make the Mage tower a Doomed Hometown is entirely in your hands. The only one that holds true is the Human Noble origin: Highever falls to Howe's men, you're the only survivor, and you'll never see it again in the game. In the sequel, Hawke's hometown of Lothering is destroyed by the Darkspawn. This had already happened in the first game, it's just that the player is seeing it from a different perspective. Also, depending on dialouge choices, Hawke and Merril may be forced to kill Merril's (and the Dalish Warden's) tribe in self-defense. Yes, the heroes can not only slaughter their own home, but also the home of the previous game's hero. The Dalish elves lost their homeland earlier in the game's history, when they tried to cut off ties to the Tevinter Imperium - the Imperium invaded and enslaved most of the race, going so far as to sink their capital city beneath the earth. After winning their freedom, they built a second homeland in the Dales... which was then destroyed when the Church led an Exalted March against them. Sweet Water, the hometown of the main characters of Might and Magic VI is destroyed during the Night of Falling Stars, and your characters are forced to flee from a devil attack during the intro. In In Famous, pressing the start button causing a bomb to go off that kills countless and levels six city blocks. The Haitian is revealed to have come from one of these in 'It Takes a Village'. Parodied in this Fanboys strip. Order of the Stick: Start of Darkness shows that Redcloak's village and all of its inhabitants (except for him and his brother) were destroyed by the Sapphire Guard shortly after his initiation as a cleric. In Endstone, the day Kyri met Jon, her tribe was massacred. Inverted in Looking for Group. A contingent of the Legarian forces try to convert a little town up the coast. Said town happens to be the source of Richard's power. Hilarity Ensues. Beartato from Nedroid hails from a doomed home planet according to his secret origin comic. Then Reginald happens. In The Gamers Alliance, this happens to Skye when the Clergy of Mardük and Yamatians raze her hometown because it helped the Grand Alliance on its quest to liberate Remon from the Yamatian yoke. Look to the West: This happens so often, and so nonchalantly, during the background of various revolutionary leaders it is almost a running gag. Look To The Burning House Where Your Family Used To Live. To be fair, Zuko really didn't care what happened as long as he captured the Avatar. The village in An American Tail, which is sacked in a cat-Cossack pogrom at the very beginning, in a Fiddler on the Roof parody. Surprisingly, this is intended to be a real town, which has in fact survived. Discord from My Little Pony Friendship Is Magic uses the threat of this in a Sadistic Choice on Rainbow Dash, forcing her to choice between allowing her hometown of Cloudsdale to be destroyed or helping her friends stop Discord. Even worse, there's nothing to imply it isn't happening for real and Discord is just enough of a Complete Monster to go through with it. This page was last edited on 8 October 2018, at 08:08.